Here at The A.V. Club, we engage in lively banter about the dictionary for fun, so when a truly special opportunity to prove our prowess with the English language comes along, you’d better believe we’re going to take it. Today such an opportunity presented itself with a letter from Marc Kasowitz, a personal attorney to President Donald Trump whose website describes him as “the toughest lawyer on Wall Street.” In the letter, Kasowitz attempts to frame former FBI director James Comey’s testimony before the Senate Intelligence Committee this morning as a win for his client, and it’s such an amusingly desperate fumble that we couldn’t help taking him down a peg. Now, the title of “president” should generally be down-styled unless accompanied by a person’s name, as we used it above. Kasowitz, meanwhile, capitalizes titles all willy nilly throughout the letter, which our executive editor, Laura M. Browning, dismisses as a typical lawyerly quirk. 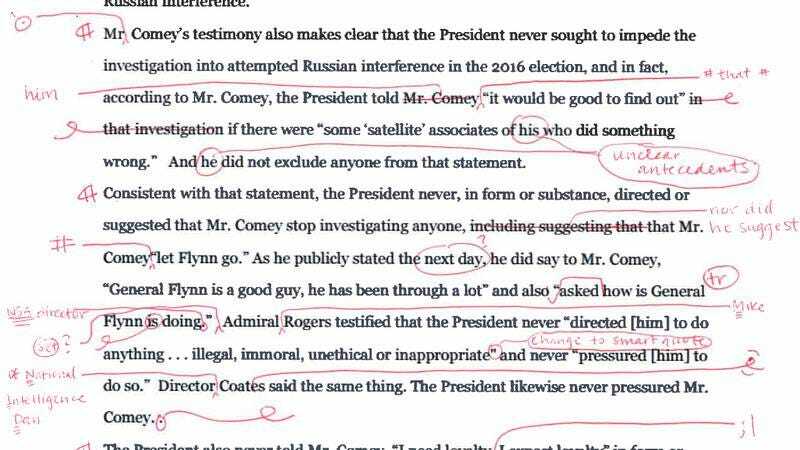 She’s less kind on Kasowitz’s spacing, which is “such a mess” that she didn’t have room to note every instance of its misuse in the document. The letter’s structure is weak, its grasp of time shaky, and “Mr. Kasowitz should know to use a person’s full title and name on first mention,” she explains. No mercy, in other words. “Overall there is a problem with sentences that don’t make sense and with slight run-ons,” she says. She takes special issue with the first sentence, saying, “I have read this 12 times, and it still makes no sense to me,” noting that the two clauses seem like they come from different drafts entirely. Asked if Kasowitz’s writing would be good enough to get him a job at The A.V. Club, we received a lengthy, all-caps expression of amusement and disdain, which we won’t reprint here, for fear that the red pen will be turned on us next. You can see the “deeply satisfying” results of our copy edit below.